The Iraqi resistance offensive continued with renewed fury last week with heavily-armed commandos attacking American patrols across the country while other partisans concentrate on dealing with collaborators and traitors. Nowhere is safe for the US troops and their lackeys – least of all Baghdad, the most-heavily garrisoned hub of the army of occupation. 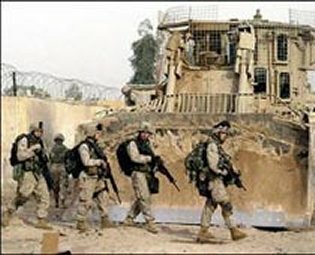 Resistance sources accuse the Americans of using banned napalm and chemical weapons in the assault on Fallujah and this was confirmed by Fallujan refugees living in Baghdad who said the main US assault was preceded by clouds of a sweet-smelling “apple-smelling” gas that created open wounds on the skin while those who inhaled it began to vomit blood. In Baghdad the resistance has virtually cut the city off from the international airport. When Australian defence minister Robert Hill landed last week he was unable to visit his own embassy in the capital. Partisans hunting collaborators in central Baghdad clashed with American troops in broad daylight after shooting an Iraqi traitor dead in Haifa Street just three blocks away from the heavily fortified “Green Zone” US military compound. Other Iraqi traitors, lackey troops selling truck-loads of loot plundered from Fallujah in a market they set up in Baghdad’s al Haswah neighbourhood were reminded of the fate that awaits them when a barrage of mortar rounds poured down on them on Tuesday. In general Iraqis wonder at what role the “national guard”, sometimes dubbed “Alawi’s army” after the quisling “interim premier”, is supposed to play as their speciality seems to be robbing and killing civilians. In the southern British-occupied zone the “national guard” are little more than highway robbers and no lorry coming from Kuwait or Basra can get past their check-points without greasing their palms. In Fallujah the resistance is continuing hit-and-run attacks in the near-deserted ruins of the town. Resistance sources claim that they still effectively control half of Fallujah and this seems to be confirmed by reports that the Americans are seeking talks with representatives of the town’s police and civil defence militia as they did last April when the Marines were driven out last time. It was a less than triumphant George W Bush who addressed his Marines at their base in California on Tuesday. Gone was the “bring them on” bravado that followed the capture of Baghdad last year. Now a sombre Bush spoke of an insurgency that was getting worse. The US leader who stood under a banner reading “Mission Accomplished” in May 2003 to claim that combat operations in Iraq had ended now could only speak of eventually stabilising Iraq. And in Kuwait US defence secretary Donald Rumsfeld faced a grilling from American troops complaining about their shoddy equipment. The troops, mainly US National Guard and reservists on their way to Iraq, cheered when one soldier told Rumsfeld they had been forced to root through rubbish for scrap metal to reinforce their armoured cars. Others complained about the extended tours they now endure and that regular soldiers got better equipment than reservists or national guard units. Anglo-American imperialism is now putting all its bets on the bogus Iraq elections set for 30 January which they hope will fire up sectarian and ethnic divisions in Iraq and allow them to divide and rule for years to come. But nobody believes that any poll under the bayonets of the US-led army of occupation can be anything but free and fair. Few think it can even take place. Russian President Vladimir Putin is one of them. He told visiting Iraqi stooge premier Alawi in Moscow that: “I honestly say that I cannot imagine how elections can be organised under a full occupation of the country by foreign troops. I also cannot imagine how you, on your own, will be able to restore the situation in the country and stop it from breaking up”. Forty six eminent figures including five former ambassadors, bishops, a retired general and the former assistant chief of defence staff have signed an open letter to Tony Blair urging an inquiry into civilian deaths in Iraq. The call for an independent inquiry into the number of Iraqis killed or wounded along with the reasons for the casualties follows the study by the British medical journal The Lancet that put the death-toll at around 100,000. Nobody knows how many Iraqis have been killed during and since the Anglo-American invasion last year. What we do know is that neither the Blair government nor its masters in Washington want to tell us what their own assessment is. The weasel words of the Government, in response, have been to bleat that only the Americans can provide the answers. This is undoubtedly true as the Americans are responsible for most of the deaths. But it doesn’t stop the Government from claiming that the puppet regime’s own low estimates are the most accurate data available. The imperialists have no hesitation in producing figures of human rights violations when it suits their interests. Colossal casualty figures for the conflict in Darfur are cited to justify possible intervention against Sudan despite the fact that they are seriously and vigorously disputed by the Sudanese authorities. The British government, as a major occupying power in Iraq, has the responsibility to assess the death toll amongst Iraqi civilians that are theoretically under its protection. If the British occupation authorities haven’t got the means to do it then they must ask the Americans for it. Then they tell the British public what really has been done in our name over the past 18 months. Home Secretary David Blunkett has been in the media spot-light this week but not of his choosing. He’s admitted to paying for his former girl-friend’s first-class travel tickets out of public funds. He claims it was a “genuine mistake” and the money has subsequently been repaid. More seriously, Blunkett’s been accused of using his position to advance the visa application of her nanny. Though the allegation have been referred to an inquiry there can be little confidence in it given the past whitewashes over the “dodgy dossier” Iraqi arms scandal or the mysterious death of the Iraqi weapons inspector, Dr Kelly. Blair and his cronies have closed ranks around Blunkett to dismiss media attacks as intrusions into the Home Secretary’s private life and personal misfortunes with a reticence they never displayed in opposition when it came to Tories under the sleaze scrutiny. Blunkett is one of Blair’s loyal henchmen who has given the task of pioneering the most reactionary legislation in Labour’s history in the new parliament. No-one in the labour will movement will miss him if he goes. The issue is clear. David Blunkett must resign if he is found to have abused his position by fast-tracking the visa application of his former girl-friend’s nanny.